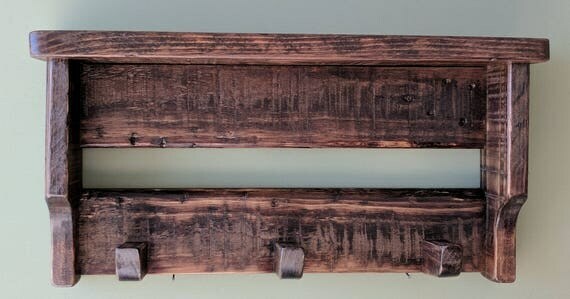 This rustic storage rack was made from reclaimed and repurposed pallet wood and has been stained with Minwax Provincial and sealed with Minwax Satin Polyurethane. The rack has three wooden pegs. Great for your foyer, mudroom or near any door – perfect to hang your hats, dog leashes, purses or coats. There is a shelf on the top to sit photos, plants, etc. No hardware is included to hang this rack. Approximate measurements at biggest points: 22" long x 5 1/4" deep x 11" high. May have imperfections in the wood, such as dents, cracked wood, knots, discoloration, nail holes, ink stamps, etc.